How To Say "I Love You" in Tibetan? 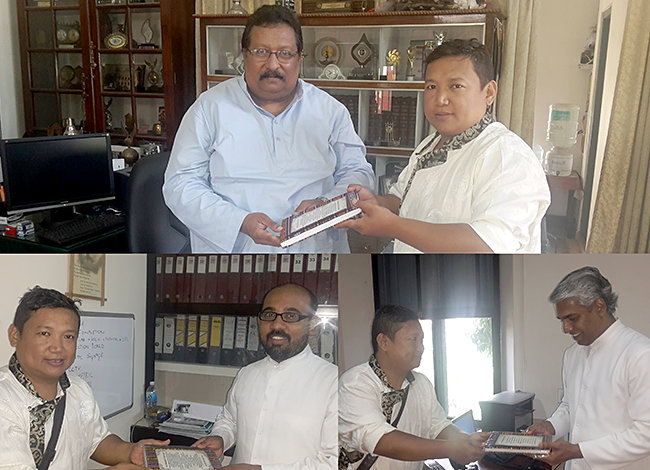 Shri Namgyal Tsundu presenting Handmade Tibetan Notebooks to the members of the management of St. Albert's College, Kochi, Kerala on World Tibet Day. (Top) Prof Harry Cleetus, Principal, St Albert's College; (Left) Rev Fr Christy Pathiyala, Assistant Manager, St. Albert's College and (Right) Rev Fr Antony Anackal, Manager, St. Albert's College. 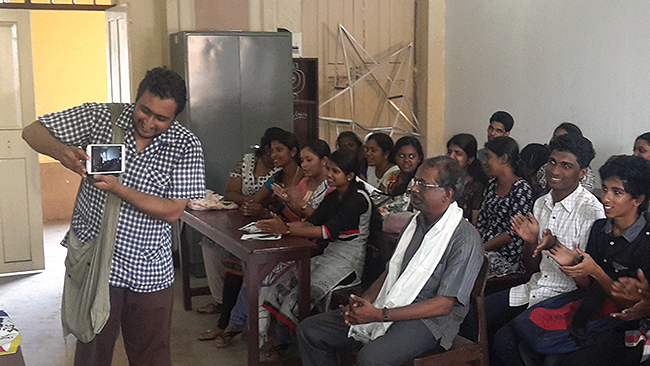 A report on the interactive session organised by Dr Appu Jacob John, Professor, St Albert's College and Campaigner, Friends of Tibet at St Albert's College, Ernakulam on July 8, 2015. Not many Tibetans in exile would have to face such a question. Individual love might not matter much for them since they are all for the Universal one. Such a situation arose recently for the Tibetan community in Kochi. On July 8, 2015, as part of the world-wide celebrations of World Tibet Day, Albertian Institute of Management (AIM) and The English Association of St. Albert's College (TEA), Ernakulam, associated with Friends of Tibet, to organise a cultural day. Members of the Tibetan Merchants Association, Kochi, Shri Namgyal Tsundu, Shri Pempa Tsering, Smt Yangzen Chomphel, Shri Ngwang, were present at the cultural interchange programme. 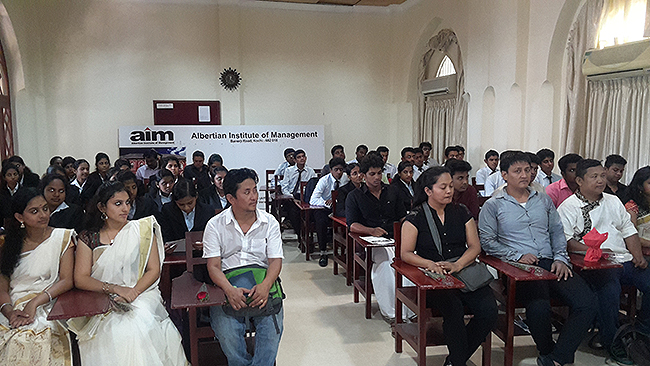 The Programme at Albertian Institute of Management (AIM) began at 12pm. 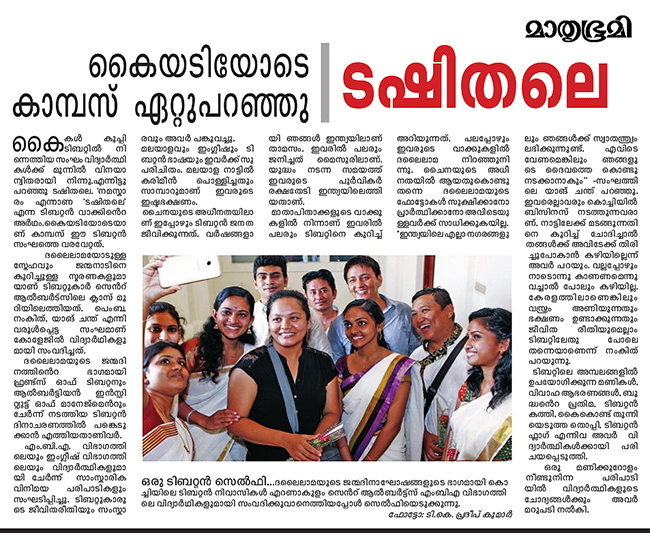 Students dressed in traditional Kerala dress gave a warm welcome to the Tibetans. The Director of the institute, Dr Rajagopalan Nair, enlightened the students on the need of supporting the Tibetan cause. He spoke at length about the situation that forced the Tibetans to seek refuge. Following Dr Nair's address to the students, Shri Eswar Anandan, Campaigner, Friends of Tibet, introduced World Tibet Day to the students and acted as a moderator, inviting the students to interact with the Tibetan friends. Shri Pempa Tsering spoke about the culture in exile. He also spoke to the management students about the importance of entrepreneurship. Smt Yangzen Chomphel enthralled the audience introducing them to the Tibetan Language. The students wanted to know about the food delicacies and where they would get authentic Tibetan Momos and wanted to know about the art of noodle making. The students were also curious to know the how they should say 'I Love You’ in Tibetan Language.The obedient students they were, they sincerely wrote down the pronunciation and repeated after their new found teacher, Smt Yangzen Chomphel! Shri Namgyal Tsundu mesmerised the audience with his dexterous ability talking Malayalam. Students of the Albertian Institute of Management listening to Shri Eswar Anandan, Campaigner, Friends of Tibet (not in pic), who spoke about World Tibet Day and Friends of Tibet. Eswar Anandan also recited "Wake Up O People", a poem dedicated to World Tibet Day 2015. (A) Prof Harry Cleetus, Principal, St Albert's College, Ernakulam, Kerala, inaugurating the interactive session "TEA with Tibetans" organised by The English Association (TEA) in association with Friends of Tibet, by lighting the Traditional Tibetan Butter Lamp. (B) Shri Namgyal Tsundu and Shri Eswar Anandan, Campaigner, Friends of Tibet explaining various symbols present in the outlawed Tibetan National Flag to the members of The English Association (TEA). (C) The members of The English Association (TEA) clapping their hands and wishing His Holiness the XIV Dalai Lama on his 80th birthday. The members shot a Video Selfie together, for the newly launched website: www.makeawish.space, singing and wishing the Dalai Lama a long life. The students were very excited to see the various Tibetan artifacts and antique items exhibited and explained. The students wished His Holiness the XIV Dalai Lama in a video selfie covering the whole group of students. This was followed by a photo opportunity with the Tibetan Friends. Shri Namgyal Tsundu honoured the Director, Dr Rajagopalan Nair with 'Khata', traditional Tibetan white scarf. The Director of the institute thanked the team for their time and for helping the students know more about Tibet and its Culture and presented a plaque to the Tibetan team. The programme concluded with the students singing traditional Malayalam songs. The English Association (TEA), St Albert's College arranged a interactive session between students of the English Department and the Tibetan Team. Principal of the college, Prof Harry Cleetus inaugurated the programme by lighting the Traditional Tibetan Butter Lamp. Shri Eswar Anandan introduced World Tibet Day and the Tibetan friends to the members of the association and moderated the session. Similar to the programme at the Albertian Institute of Management, there was a cultural interchange session followed by birthday wishes video selfie and rendering of Malayalam songs. The Tibetan Team honoured Prof Dr Leslie Thomas, Head of the Department and Prof George Vineeth NJ, Teacher Coordinator with the Traditional Tibetan 'Khata'. The team also presented 'Lungta' the Tibetan Prayer flag to Shri Akhil S, student, for designing World Tibet Day Bookmark. Shri Eswar Anandan, Campaigner, Friends of Tibet helping the members of The English Association (TEA) shoot video selfie wishing His Holiness the XIV Dalai Lama on his 80th birthday. The members of TEA enthusiastically wished the Dalai Lama a long life and later sang a couple of Traditional Malayalam Songs to be uploaded to the newly launched website: www.makeawish.space. Earlier, the Tibetan team met the Manager of the College, Rev Fr Antony Anackal, and the Assistant Manager Rev Fr Christy Pathiyala. The team also met the Principal Prof Harry Cleetus, the Vice Principal Prof Dr Jude Martin Mendez. The team thanked them for the opportunity and spoke how St Albert's have always welcomed them and organised various exhibitions and campaigns in the past. The team presented Tibetan handmade books to the officials. Its certain that the moments spent with the this group of people, who have lost their homeland and look forward to go back to their Nation - Tibet, would be in the memories of the students for a long time to come. We love you Tibetans!